Most of the houses in Sutton up until 1500 were timber-framed single-storey buildings with a thatched roof - easily burned down. They were heated by an open fire in the centre of the main room or hall, and this was a wood-burning fire, the smoke escaping through vents in the roof. Manorial custom allowed the inhabitants to collect dead wood for firing anywhere in the extensive woods and commons. Most of the cooking was done over the open fire, but there were ovens for baking, some built in to the houses, more usually separate as was the one recently revealed by an archaeological investigation in Coleshill Street. The houses built by Bishop Vesey in the 1530s all had hearths and chimneys - the fire risk was much reduced in a stone house - and this took away the smoke; these houses all had upstairs rooms. By 1600, as the use of bricks became common, most houses had chimneys and upper rooms, the hearth was used for cooking, but the bread ovens were still needed. The oven was filled with dry brushwood which burnt quickly with a fierce heat, the ashes were removed and the loaves inserted, being baked by the heat retained in the oven. Bundles of brushwood were known as “kids” - they could be made up in the Park or on the commons using gorse and other bushes, but if anyone made kids for “out-parishioners” they were heavily fined. When Richard Stonyer died in 1639 his goods were valued. He had a spit, tongs, fire shovel, pothooks and hangers, altogether worth three shillings. Coal was now the preferred fuel, as he had three shillings worth. The houses of more prosperous families had fireplaces in every room - when the White Hart Inn (an old half-timbered inn) was destroyed by fire in 1623 the house was rebuilt in stone with thirteen brick chimneys. On his Restoration to the throne in 1660 King Charles II introduced a new tax. This was a tax on every fireplace; in Sutton the wealthy Pudseys of Langley Hall had to pay tax on all sixteen of their hearths, while a hundred poor people with only one hearth each were excused because they were likely to need parish relief. Poor people in Sutton heated their cottages with wood and peat fires when they could not afford coal, but by 1733 even the poorest widow could expect to receive a load of coal from the Overseers of the Poor. 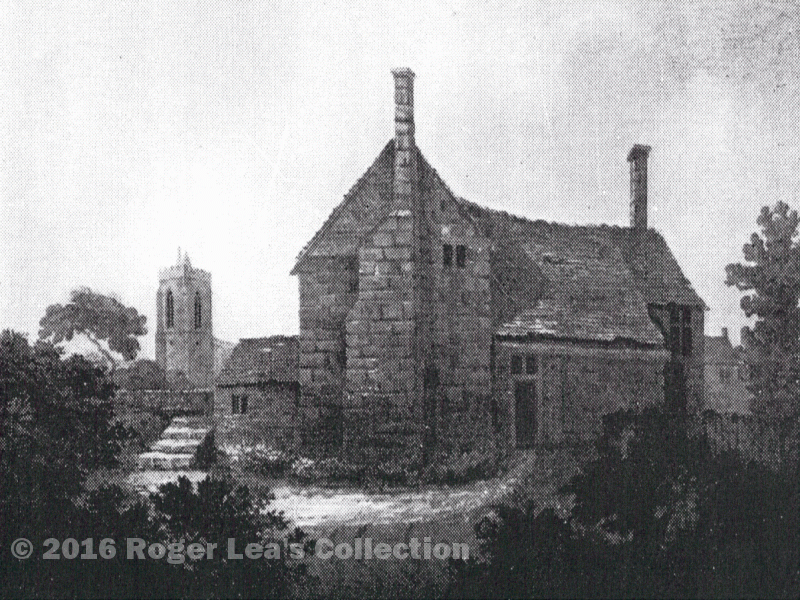 The old Schoolmaster’s House of Bishop Vesey’s Grammar School, demolished 200 years ago, showing the huge stone chimney. Every effort has been made to trace all copyright holders, but if any have been inadvertently overlooked the Group will be pleased to remedy any omission at the first opportunity. The Group acknowledges the assistance of Sutton Coldfield Reference Library in providing access to documents and for permission to include photographs from their archives, on this site. Copyright © 2019 Sutton Coldfield Local History Research Group. All Rights Reserved.